The DVD stands out as one of the most rapidly adopted consumer technologies ever, but in the electronics industry it's akin to an aging king in Shakespearean drama - rivals are lurking, knives drawn. Just as consumers are beginning to get comfortable with their DVD players, electronics manufacturers are set to introduce next-generation discs that store more - and would be harder to copy. A dozen companies, headed by Sony Corp., are pushing a disc called the Blu-ray. The other main contender, the High Definition DVD, is promoted only by Toshiba Corp. and NEC Corp. But it has an important endorsement from an industry group and is also expected to get Microsoft Corp.'s support as the software giant seeks a toehold for its multimedia format in the consumer electronics arena. Movie studios generally aren't commenting on the new formats. And the rival industry groups aren't saying exactly when they expect to have players on the market. Both, however, consider the DVD ripe for replacement next year. For consumers, the benefit of a new format would be better image quality. Sales of high-definition TV sets have finally started to take off, but current DVDs don't have the resolution to get the most out of HDTV sets. For the industry, a new format could mean an escape from the low-margin market DVD players have become. From costing more than $500 when introduced in 1997, players are now available for less than $50. The new discs, which look much like DVDs, would be read by players with newly developed blue lasers, which can pick out finer detail than the red lasers used to play DVDs and CDs. This lets the new discs store three to five times as much data as a DVD, enough for high-definition movies with surround sound. Manufacturers from both groups plan to also build red lasers into their new players, allowing them to read current DVDs. The Blu-ray disc has the most storage capacity, up to 50 gigabytes. However, it achieves that capacity by using a structure quite different from DVDs. This means that the companies that make prerecorded DVDs would have to invest in new equipment, which is sure to give Hollywood pause as it ponders which format to back. The Blu-ray does have the widest support among electronics manufacturers, counting not only most of the big Japanese names but also Dell Inc. and Hewlett-Packard Co. in its consortium. Toshiba's HD-DVD stores up to 30 gigabytes, but can close the quality gap with the Blu-ray by using more efficient compression software than the MPEG-2 standard already used in DVDs and planned for the Blu-ray. One of the several compression schemes that may go into the final HD-DVD standard is none other than Microsoft's Windows Media 9 software. "If that goes through, it's going to be a huge win for Microsoft," says Vamsi Sistla, an analyst at ABI Research. It wouldn't necessarily mean a significant financial windfall - the analyst estimates that Microsoft may get 10 to 15 cents per player in royalties - but that's not the point. "More than money, they're looking for the muscle power to enter the consumer electronics industry," he says. The HD-DVD has been endorsed by the DVD Forum, the industry group that created the DVD, but that may not be as crucial as it sounds. The group has not succeeded in gathering industry-wide consensus for any disc standard since the original DVD in 1997. Both its audio and rewriteable DVD standards have competitors. The Blu-ray and HD-DVD both use hardware advances to store high-definition movies. However, that's not strictly necessary. Improvements in the software used to pack a movie onto a disc means that it's possible to store a high-definition movie on a regular DVD, albeit with poorer quality and fewer special features than on a blue-laser disc. Microsoft demonstrated that when it helped bring out a high-definition version of "Terminator 2: Judgment Day" on a DVD-ROM last year. It played only on computers, but in theory, a specially built DVD player could play it back. That lesson wasn't lost on Japan's Asian competitors. In China, the EVD, or Enhanced Video Disc, is already on sale. It uses software from On2 Technologies Inc. to store a high-definition movie on a slightly modified DVD, read by a red laser. Not to be outdone, Taiwanese researchers this month demonstrated the FVD, or Forward Versatile Disc, based on the same principle. Players should be on sale this year. The advantage of using red lasers is that the components are much cheaper than the blue-laser technology, and the players can read DVDs without a second laser. With all these alternatives, there's a "very good chance" that there won't be one successor to the DVD, but several, says Sistla. The Blu-ray may dominate Japan, the cheaper EVD the rest of Asia, and the HD-DVD could be the format of choice in the United States and Europe. The real kingmaker in the drama is Hollywood. Of the big studios, only Columbia TriStar has expressed support for either format. Since it's owned by Sony, its choice was clear. One thing the studios are sure to appreciate is that the new discs promise much better copy protection than DVDs. While the older format has been a boon to the studios - it grossed them more than theatrical releases last year - its susceptibility to piracy has been a thorn. A new disc format probably holds another attraction for the studios - the opportunity to sell old movies all over again on new media. But Geoffrey Kleinman, who runs the review site DVDtalk.com, doesn't think consumers are clamoring for something better than the DVD. "A high-quality progressive-scan DVD player properly connected to high definition TV looks fantastic," he says. Also, what made the DVD popular isn't just the quality advantage over videotape, but also the addition of special features. So far, Kleinman hasn't seen any similar must-have advantage planned for the new formats. If there's a pent-up demand for a new disc, it's probably on the recording side, Kleinman believes. 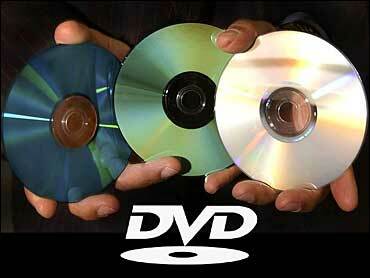 There's no cheap or easy way to record HDTV broadcasts, something recordable versions of the new discs would address. Sony is already selling a Blu-ray recorder for HDTV satellite broadcasts in Japan.